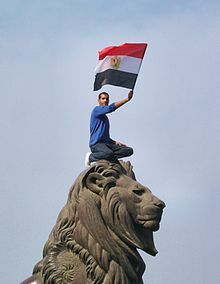 The Egyptian revolution of 2011, locally known as the January 25 Revolution (Egyptian Arabic: ثورة 25 يناير‎; Thawret 25 yanāyir), began on 25 January 2011 and took place across all of Egypt. The date was set by various youth groups to coincide with the annual Egyptian "police day" as a statement against increasing police brutality during the last few years of Mubarak's presidency. It consisted of demonstrations, marches, occupations of plazas, non-violent civil resistance, acts of civil disobedience and strikes. Millions of protesters from a range of socio-economic and religious backgrounds demanded the overthrow of Egyptian PresidentHosni Mubarak. The revolution started by calls for protests from online youth groups. Initially these included liberal, anti-capitalist, nationalist, and feminist elements, but they finally included Islamist elements as well. Violent clashes between security forces and protesters resulted in at least 846 people killed and over 6,000 injured. Protesters retaliated by burning over 90 police stations across the country. The protests took place in Cairo, Alexandria, and in all major cities across the nation. The Egyptian protesters' grievances focused on legal and political issues, including police brutality, state-of-emergency laws, lack of free elections and freedom of speech, corruption, and economic issues including high unemployment, food-price inflation and low wages. The protesters' primary demands were the end of the Mubarak regime and emergency law, freedom, justice, a responsive non-military government and a voice in managing Egypt's resources. Strikes by labour unions added to the pressure on government officials. During the uprising, the capital Cairo was described as "a war zone" and the port city of Suez saw frequent violent clashes. Protesters defied a government-imposed curfew, which was impossible to enforce by the police and military. Egypt's Central Security Forces, loyal to Mubarak, were gradually replaced by military troops. In the chaos, there was some looting by gangs which was instigated (according to opposition sources) by plainclothes police officers. In response, watch groups were organized by civilians to protect neighbourhoods. International reaction has varied, with most Western nations condoning peaceful protests but concerned about the stability of Egypt and the region. The Egyptian and Tunisian revolutions have influenced demonstrations in other Arab countries, including Yemen, Bahrain, Jordan, Syria and Libya. Mubarak dissolved his government, appointing former head of the Egyptian General Intelligence DirectorateOmar Suleiman vice-president in an attempt to quell dissent. Mubarak asked aviation minister and former chief of Egypt's air force Ahmed Shafik (who ran for presidency later) to form a new government. Mohamed ElBaradei became a major opposition figure, with all major opposition groups supporting his role as negotiator for a transitional unity government. In response to mounting pressure, Mubarak, in another attempt to contain the crisis, announced he did not intend to seek re-election in September. On 11 February 2011, Vice President Omar Suleiman announced that Mubarak would resign as president, turning power over to the Supreme Council of the Armed Forces (SCAF). The military junta, headed by effective head of state Mohamed Hussein Tantawi, announced on 13 February that the constitution would be suspended, both houses of parliament dissolved and the military would rule for six months (until elections could be held). The previous cabinet, including Prime Minister Ahmed Shafik, would serve as a caretaker government until a new one was formed. Shafik, seen by the masses as another Mubarak figure, resigned on 3 March, a day before major protests to force him to step down were planned, and was replaced by former transport minister Essam Sharaf. On 24 May 2011, Mubarak was ordered to stand trial on charges of premeditated murder of peaceful protesters and, if convicted, could have faced the death penalty. On 2 June 2012, Mubarak was found guilty of complicity in the murder of protesters and sentenced to life imprisonment, but the sentence was overturned on appeal and a retrial ordered. A number of protesters, upset that others tried with Mubarak (including his two sons) were acquitted, took to the streets. Mubarak was eventually cleared of all charges on 29 November 2014, although Egypt's prosecutor general announced he would appeal the verdict. After the revolution against Mubarak and a period of rule by the Supreme Council of the Armed Forces, the Muslim Brotherhood took power in Egypt through a series of popular elections, with Egyptians electing Islamist Mohamed Morsi to the presidency in June 2012. However, Morsi's government encountered fierce opposition after his attempt to pass an Islamist constitution that followed extreme Islamist views. Morsi attempted also to change laws granting himself unparalleled powers like no other president in Egyptian history. It sparked general outrage from secularists and members of the military, and mass protests broke out against his rule on 28 June 2013. On 3 July 2013, Morsi was deposed by a coup d'état led by the minister of defense, General Abdel Fattah El-Sisi as millions of Egyptians took to the streets in support of early elections.El-Sisi went on to become Egypt's president by popular election in 2014. In Egypt and other parts of the Arab world, the protests and governmental changes are also known as the 25 January Revolution (ثورة 25 ينايرThawrat 25 Yanāyir), Freedom Revolution (ثورة حريةThawrat Horeya) or Rage Revolution (ثورة الغضبThawrat al-Ġaḍab), and (less frequently) the Youth Revolution (ثورة الشبابThawrat al-Shabāb), Lotus Revolution (ثورة اللوتس) or White Revolution (الثورة البيضاءal-Thawrah al-bayḍāʾ). Hosni Mubarak became President of Egypt after the assassination of Anwar Sadat in 1981. Mubarak's National Democratic Party (NDS) maintained one-party rule under a continual state of emergency. His government received support from the West and aid from the United States by its suppression of Islamic militants and peace with Israel. Mubarak was often compared to an Egyptian pharaoh by the media and some critics, due to his authoritarian rule. He was in the 30th year of his reign when the Revolution of 2011 began. Gamal Mubarak, Mubarak's younger son, was expected to succeed his father as the next president of Egypt in 2000. Gamal began receiving attention from the Egyptian media, since there were apparently no other heirs to the presidency.Bashar al-Assad's rise to power in Syria in June 2000, hours after Hafez al-Assad's death, sparked debate in the Egyptian press about the prospects for a similar scenario in Cairo. During the years after Mubarak's 2005 re-election, several left- and right-wing (primarily unofficial) political groups expressed opposition to the inheritance of power, demanded reforms and asked for a multi-candidate election. In 2006, with opposition increasing, Daily News Egypt reported an online campaign initiative (the National Initiative against Power Inheritance) demanding that Gamal reduce his power. The campaign said, "President Mubarak and his son constantly denied even the possibility of [succession]. However, in reality they did the opposite, including amending the constitution to make sure that Gamal will be the only unchallenged candidate." During the decade, public perception grew that Gamal would succeed his father. He wielded increasing power as NDP deputy secretary general and chair of the party's policy committee. Analysts described Mubarak's last decade in power as "the age of Gamal Mubarak". With his father's health declining and no appointed vice-president, Gamal was considered Egypt's de facto president by some. Although Gamal and Hosni Mubarak denied an inheritance of power, Gamal could be elected; with Hosni Mubarak's presidential term set to expire in 2010, speculation existed that Gamal would run as the NDP candidate in 2011. However, after the January–February 2011 protest Gamal Mubarak said that he would not run for president in the 2011 elections. Emergency law (Law No. 162 of 1958) was enacted in the country after the 1967 Six-Day War. Although it was suspended for 18 months during the early 1980s, it has otherwise continuously been in effect since Anwar Sadat's 1981 assassination. Emergency law extended police powers, suspended constitutional rights, legalised censorship and abolished habeas corpus. It limits non-governmental political activity, including demonstrations, unapproved political organizations and unregistered financial donations. The Mubarak government has cited the threat of terrorism in extending emergency law, claiming that opposition groups such as the Muslim Brotherhood could gain power in Egypt if the government did not forgo parliamentary elections and suppress the group through emergency law. This has led to the imprisonment of activists without trial, illegal, undocumented and hidden detention facilities and the rejection of university, mosque and newspaper staff based on their political affiliation. A December 2010 parliamentary election was preceded by a media crackdown, arrests, candidate bans (particularly Muslim Brotherhood candidates) and allegations of fraud due to the near-unanimous victory by the NDP in parliament. Human-rights organizations estimate that in 2010, between 5,000 and 10,000 people were in long-term detention without charge or trial. According to a U.S. Embassy report, police brutality has been widespread in Egypt. In the five years before the revolution, the Mubarak regime denied the existence of torture or abuse by police. However, claims by domestic and international groups provided cellphone videos or first-hand accounts of hundreds of cases of police brutality. According to the 2009 Human Rights Report from the U.S. State Department, "Domestic and international human rights groups reported that the Ministry of Interior (MOI) State Security Investigative Service (SSIS), police, and other government entities continued to employ torture to extract information or force confessions. The Egyptian Organization for Human Rights documented 30 cases of torture during the year 2009. In numerous trials defendants alleged that police tortured them during questioning. During the year activists and observers circulated some amateur cellphone videos documenting the alleged abuse of citizens by security officials. For example, on 8 February, a blogger posted a video of two police officers, identified by their first names and last initials, sodomizing a bound naked man named Ahmed Abdel Fattah Ali with a bottle. On 12 August, the same blogger posted two videos of alleged police torture of a man in a Port Said police station by the head of investigations, Mohammed Abu Ghazala. There was no indication that the government investigated either case." The deployment of Baltageya (Arabic: بلطجية‎)—plainclothes police—by the NDP has been a hallmark of the Mubarak government. The Egyptian Organisation for Human Rights has documented 567 cases of torture, including 167 deaths, by police from 1993 to 2007. Excessive force was often used by law-enforcement agencies against popular uprisings. On 6 June 2010 Khaled Mohamed Saeed died under disputed circumstances in the Sidi Gaber area of Alexandria, with witnesses testifying that he was beaten to death by police - an event which galvanized Egyptians around the issue of police brutality. A Facebook page, "We are all Khaled Said", helped attract nationwide attention to the case.Mohamed ElBaradei, former head of the International Atomic Energy Agency, led a 2010 rally in Alexandria against police abuse, and visited Saeed's family to offer condolences. During the January–February 2011 protests, police brutality was common. Jack Shenker, a reporter for The Guardian, was arrested during the Cairo protests on 26 January. He witnessed fellow Egyptian protesters being tortured, assaulted, and taken to undisclosed locations by police officers. Shenker and other detainees were released after covert intervention by Ayman Nour, the father of a fellow detainee. Corruption, coercion not to vote and manipulation of election results occurred during many elections over Mubarak's 30-year rule. Until 2005, Mubarak was the only presidential candidate (with a yes-or-no vote). Mubarak won five consecutive presidential elections with a sweeping majority. Although opposition groups and international election-monitoring agencies charged that the elections were rigged, those agencies were not allowed to monitor elections. The only opposition presidential candidate in recent Egyptian history, Ayman Nour, was imprisoned before the 2005 elections. According to a 2007 UN survey, voter turnout was extremely low (about 25 percent) because of a lack of trust in the political system. The population of Egypt grew from 30,083,419 in 1966 to roughly 79,000,000 by 2008. The vast majority of Egyptians live near the banks of the Nile, in an area of about 40,000 square kilometers (15,000 sq mi) where the only arable land is found. In late 2010, about 40 percent of Egypt's population lived on the equivalent of roughly USD$2 per day, with a large portion relying on subsidized goods. According to the Peterson Institute for International Economics and other proponents of demographic structural approach (cliodynamics), a basic problem in Egypt is unemployment driven by a demographic youth bulge; with the number of new people entering the workforce at about four percent a year, unemployment in Egypt is almost 10 times as high for college graduates as for those who finished elementary school (particularly educated urban youth—the people who were in the streets during the revolution). Egypt's economy was highly centralised during the presidency of Gamal Abdel Nasser, becoming more market-driven under Anwar Sadat and Mubarak. From 2004 to 2008 the Mubarak government pursued economic reform to attract foreign investment and increase GDP, later postponing further reforms because of the Great Recession. The international economic downturn slowed Egypt's GDP growth to 4.5 percent in 2009. In 2010, analysts said that the government of Prime Minister Ahmed Nazif would need to resume economic reform to attract foreign investment, increase growth and improve economic conditions. Despite recent high national economic growth, living conditions for the average Egyptian remained relatively poor (albeit better than other African nations with no significant social upheavals). Political corruption in the Mubarak administration's Interior Ministry rose dramatically, due to increased control of the system necessary to sustain his presidency. The rise to power of powerful businessmen in the NDP, the government and the House of Representatives led to public anger during the Ahmed Nazif government. Ahmed Ezzmonopolised the steel industry, with more than 60 percent of market share. Aladdin Elaasar, an Egyptian biographer and American professor, estimated that the Mubarak family was worth from $50 to $70 billion. The wealth of former NDP secretary Ezz was estimated at 18 billion Egyptian pounds; the wealth of former housing minister Ahmed al-Maghraby was estimated at more than 11 billion Egyptian pounds; that of former tourism minister Zuhair Garrana is estimated at 13 billion Egyptian pounds; former minister of trade and industry Rashid Mohamed Rashid is estimated to be worth 12 billion Egyptian pounds, and former interior minister Habib al-Adly was estimated to be worth eight billion Egyptian pounds. The perception among Egyptians was that the only people benefiting from the nation's wealth were businessmen with ties to the National Democratic Party: "Wealth fuels political power and political power buys wealth." During the 2010 elections, opposition groups complained about government harassment and fraud. Opposition and citizen activists called for changes to a number of legal and constitutional provisions affecting elections. In 2010, Transparency International's Corruption Perceptions Index (CPI) gave Egypt a score of 3.1 based on perceptions by business people and analysts of the degree of corruption (with 10 being clean, and 0 totally corrupt). To prepare for the possible overthrow of Mubarak, opposition groups studied Gene Sharp's work on nonviolent action and worked with leaders of Otpor!, the student-led Serbianorganisation. Copies of Sharp's list of 198 non-violent "weapons", translated into Arabic and not always attributed to him, were circulated in Tahrir Square during its occupation. Following the ousting of Tunisian president Zine El Abidine Ben Ali after mass protests, many analysts (including former European Commission PresidentRomano Prodi) saw Egypt as the next country where such a revolution might occur. According to The Washington Post, "The Jasmine Revolution [...] should serve as a stark warning to Arab leaders – beginning with Egypt's 83-year-old Hosni Mubarak – that their refusal to allow more economic and political opportunity is dangerous and untenable." Others believed that Egypt was not ready for revolution, citing little aspiration by the Egyptian people, low educational levels and a strong government with military support. The BBC said, "The simple fact is that most Egyptians do not see any way that they can change their country or their lives through political action, be it voting, activism, or going out on the streets to demonstrate." After the self-immolation of Mohamed Bouazizi in Tunisia on 17 December, a man set himself afire on 18 January in front of the Egyptian parliament and five more attempts followed. On 17 January, Abdou Abdel Monaam, a baker, also set himself on fire to protest a law that prevented restaurant owners from buying subsidized bread, leading him to buy bread at the regular price - which is five times higher than the subsidized. Mohammed Farouq Mohammed, who is a lawyer, also set himself afire in front of the parliament to protest his ex-wife, who did not allow him to see his daughters. In Alexandria, an unemployed man by the name of Ahmed Hashem Sayed was also a victim of self-immolation. Opposition groups planned a day of revolt for 25 January, coinciding with National Police Day, to protest police brutality in front of the Ministry of Interior. Protesters also demanded the resignation of the Minister of Interior, an end to State corruption, the end of emergency law and presidential term limits for the president. Many political movements, opposition parties and public figures supported the day of revolt, including Youth for Justice and Freedom, the Coalition of the Youth of the Revolution, the Popular Democratic Movement for Change, the Revolutionary Socialists and the National Association for Change. The April 6 Youth Movement was a major supporter of the protest, distributing 20,000 leaflets saying "I will protest on 25 January for my rights". The Ghad El-Thawra Party, Karama, Wafd and Democratic Front supported the protests. The Muslim Brotherhood, Egypt's largest opposition group, confirmed on 23 January that it would participate. Public figures, including novelist Alaa Al Aswany, writer Belal Fadl and actors Amr Waked and Khaled Aboul Naga, announced that they would participate. The leftistNational Progressive Unionist Party (the Tagammu) said that it would not participate, and the Coptic Church urged Christians not to participate in the protests. Twenty-six-year-old Asmaa Mahfouz was instrumental in sparking the protests. In a video blog posted a week before National Police Day, she urged the Egyptian people to join her on 25 January in Tahrir Square to bring down the Mubarak regime. Mahfouz's use of video blogging and social media went viral and urged people not to be afraid. The Facebook group for the event attracted 80,000 people. Most causes of the 2011 Egyptian revolution against Mubarak also existed in 1952, when the Free Officers ousted King Farouk: inherited power, corruption, under-development, unemployment, unfair distribution of wealth and the presence of Israel. A new cause of the Arab Spring is the increase in population, which increased unemployment. The first sign along the road to Mubarak was the 1967 war between Egypt and Israel. Gamal Abdel Nasser's defeat brought Anwar Sadat to power after Nasser's death in 1970. Sadat undid Nasser's social reforms and dependence on the Soviet Union, predicting its collapse nearly two decades before it occurred. Sadat neglected the modernization of Egypt, and his cronyism cost the country infrastructure industries which could generate new jobs. He was succeeded by Hosni Mubarak after Sadat's 1981 death. With no academic or governmental experience, Mubarak implemented emergency rule throughout his 30 years in office, not appointing a vice president until he was pressured to resign. Communications media such as the internet, cell phones and satellite TV channels augmented mosques and Friday prayers, traditional means of mass communications. The mosques brought the Muslim Brotherhood to power, and the Brotherhood has pressured all governments from 1928 through 2011 (as it also does in neighboring countries). 25 January 2011 ("Day of Revolt"): Protests erupted throughout Egypt, with tens of thousands gathering in Cairo and thousands more in other Egyptian cities. The protests targeted the Mubarak government; while mostly non-violent, there were some reports of civilian and police casualties. 26 January 2011: Civil unrest in Suez and other areas throughout the country. Police arrested many activists. 28 January 2011: The "Friday of Anger" protests began, with hundreds of thousands demonstrating in Cairo and other Egyptian cities after Friday prayers. Opposition leader Mohamed ElBaradei arrived in Cairo amid reports of looting. Prisons were opened and burned down, allegedly on orders from Interior Minister Habib El Adly. Prison inmates escaped en masse, in what was believed to be an attempt to terrorise protesters. Police were withdrawn from the streets, and the military was deployed. International fears of violence grew, but no major casualties were reported. Mubarak made his first address to the nation, pledging to form a new government. Later that night clashes broke out in Tahrir Square between revolutionaries and pro-Mubarak demonstrators, leading to casualties. No fatalities have been reported in Cairo, however, 11 people were killed in Suez and another 170 were injured.1,030 people were reported injured nationwide. 29 January 2011: The military presence in Cairo increased. A curfew was imposed, which was widely ignored as the flow of protesters into Tahrir Square continued through the night. The military reportedly refused to follow orders to fire live ammunition, exercising overall restraint; there were no reports of major casualties. On 31 January, Israeli media reported that the 9th, 2nd, and 7th Divisions of the Egyptian Army had been ordered into Cairo to help restore order. 1 February 2011: Mubarak made another televised address, offering several concessions. He pledged political reforms and said he would not run in the elections planned for September, but would remain in office to oversee a peaceful transition. Small-but-violent clashes began that night between pro- and anti-Mubarak groups. 2 February 2011 (Camel Incident): Violence escalated as waves of Mubarak supporters met anti-government protesters; some Mubarak supporters rode camels and horses into Tahrir Square, reportedly wielding sticks. The attack caused 3 deaths and 600 injuries as a result of the violence. Mubarak repeated his refusal to resign in interviews with several news agencies. Violence toward journalists and reporters escalated, amid speculation that it was encouraged by Mubarak to bring the protests to an end. The camel and horse riders later claimed that they were "good men", and they opposed the protests because they wanted tourists to come back to keep their jobs and feed their animals. The horse and camel riders deny that they were paid by anyone, though they said that they were told about the protests from a ruling party MP. Three hundred people were reported dead by the Human Rights Watch the following day, since January 25. Wael Ghonim, Google executive and creator of the page We are all Khaled Said, was reported missing and the company asked the public to help find him. 6 February 2011: An interfaith service was held with Egyptian Christians and Muslims in Tahrir Square. Negotiations by Egyptian Vice President Omar Suleiman and opposition representatives began during continuing protests throughout the country. The Egyptian army assumed greater security responsibilities, maintaining order and guarding The Egyptian Museum of Antiquity. Suleiman offered reforms, while others in Mubarak's regime accused foreign nations (including the U.S.) of interfering in Egypt's affairs. 10 February 2011: Mubarak addressed the Egyptian people amid speculation of a military coup. Instead of resigning (which was widely expected), he said he would delegate some powers to Vice President Suleiman while remaining Egypt's head of state. Mubarak's statement was met with anger, frustration and disappointment, and in a number of cities there was an escalation in the number and intensity of demonstrations. 11 February 2011 ("Friday of Departure"): Large protests continued in many cities, as Egyptians refused to accept Mubarak's concessions. At 6:00 pm Suleiman announced Mubarak's resignation, entrusting the Supreme Council of Egyptian Armed Forces with the leadership of the country. Nationwide celebrations immediately followed. 13 February 2011: The Supreme Council dissolved Egypt's parliament and suspended the constitution in response to demands by demonstrators. The council declared that it would wield power for six months, or until elections could be held. Calls were made for the council to provide details and more-specific timetables and deadlines. Major protests subsided, but did not end. In a gesture to a new beginning, protesters cleaned up and renovated Tahrir Square (the epicenter of the demonstrations); however, many pledged to continue protesting until all demands had been met. 17 February: The army said that it would not field a candidate in the upcoming presidential elections. Four important figures in the former regime were arrested that day: former interior minister Habib el-Adly, former minister of housing Ahmed Maghrabi, former tourism minister H.E. Zuheir Garana and steel tycoon Ahmed Ezz. 2 March: The constitutional referendum was tentatively scheduled for 19 March 2011. 3 March: A day before large protests against him were planned, Ahmed Shafik stepped down as prime minister and was replaced by Essam Sharaf. 5 March: Several State Security Intelligence (SSI) buildings across Egypt were raided by protesters, including the headquarters for the Alexandria Governorate and the national headquarters in Nasr City, Cairo. Protesters said that they raided the buildings to secure documents they believed to proved crimes by the SSI against the people of Egypt during Mubarak's rule. 6 March: From the Nasr City headquarters, protesters acquired evidence of mass surveillance and vote-rigging, noting rooms full of videotapes, piles of shredded and burned documents and cells in which activists recounted their experiences of detention and torture. 19 March: The constitutional referendum passed with 77.27 percent of the vote. 22 March: Portions of the Interior Ministry building caught fire during police demonstrations outside. 23 March: The Egyptian Cabinet ordered a law criminalising protests and strikes which hamper work at private or public establishments. Under the new law, anyone organising such protests will be subject to imprisonment or a fine of EGP500,000 (about USD$100,000). 1 April ("Save the Revolution Day"): About 4,000 demonstrators filled Tahrir Square for the largest protest in weeks, demanding that the ruling military council more quickly dismantle lingering aspects of the old regime; protestors also demanded trials for Hosni Mubarak, Gamal Mubarak, Ahmad Fathi Sorour, Safwat El-Sherif and Zakaria Azmi. Egyptian population pyramid in 2005; many people age 30 and younger, despite education, have difficulty finding work. Protester holds Egyptian flag during protests which began on 25 January 2011. In the decade leading up to the Egyptian revolution the opposition organizations decried the president’s power and held rallies demanding free presidential elections. In single candidate referendums president Hosni Mubarak was elected on three separate occasions. In 2005 he faced opposition for the first time in spite of banning the Muslim Brotherhood from entering as a candidate. The Muslim Brotherhood was the most popular opposition group in Egypt and preventing them from running in the election had upset many citizens. When president Hosni Mubarak was elected yet again his runner-up was charged with fraud and put in prison. In the year 2010 independent candidates who were associated with the Muslim Brotherhood did well in the legislative elections and had started to become the biggest contingent in the opposition party for the 2010 elections. Opposing parties were not victorious to the extent that they should have been due to vote rigging, something which caused serious demands for reevaluation. Protests began on January 25th. Inspired by Tunisia success, people began taking to the streets in order to protest unemployment levels, poverty, government corruption, and the autocratic rule. These protests were the first of their scale to take place in Egypt since the 1970s. Protesters began defying curfews and the government responded to them by blocking Twitter which was one of the keys used by organizers to coordinate the protests throughout the city. This didn’t only enrage the citizens but increased the national attention to this uprising. Within the first two days of the uprising Egypt blocked access to Facebook and the riot police began arresting and injuring protesters on the streets with tear gas water cannons and batons. In cities such as Alexandria and Cairo these practices were commonplace. The Muslim Brotherhood was a fierce opponent of the current government regime, officially banned in Egypt. But as soon as the uprising began they started to support the protest helping enhancing the logistics of rioters. The government attempted to block all Internet services in the country on the first Friday after the protests began. Twitter, Facebook, email, social networking, and text messaging being locked down. The protesters began to search for alternative means of getting on the internet and distributing information among themselves. That same day the military was called in to take over the law enforcement and the US made an announcement that the aid they provided to Egypt would be put to review because of the ongoing protests. The immediate response by the president Hosni Mubarak who had remained silent during the first week was to appear on state television and make the announcement that he would be dismissing part of his government but that he himself would not step down. Shortly after this announcement President Obama urged the Egyptian president to make reformation a reality. The reforms that president Hosni Mubarak attempted to introduce did very little to satisfy the enraged citizens who demanded that the president would step down. It was in February that the opposition was invited to talks with the Egyptian government, specifically the Muslim Brotherhood, who had previously been banned. At the same time the president announced that he would not resign in spite of the fact that widespread media reports stated that he might. The following day he stepped down and the Supreme Council of the Armed Forces suspended the constitution and dissolved the legislative bodies of Egypt. A new constitution was set to be drafted during which time the military would maintain power for 6 months or until new elections could be held. The internal security services were dissolved the next month, which was considered as a victory by many Egyptian citizens due to the fact that this ministry was known for regularly using torture and violating the rights of political dissidents. In March the Egyptians approved a referendum which proposed constitutional changes to the election process, set up a time limit for president, and restrict the ability of the president to use emergency laws. This document helped pave the way for a transition to an elected government and a new constitution. Continued issues arose in spite of this progress and protesters began to call upon the government to investigate the president Hosni Mubarak finances and the finances of his sons. It was stated that Mubarak and sons had amassed a large fortune which was concealed in a foreign bank. Public prosecutors ordered the detention of the former president and his sons for further questioning. After this the sons were sent to prison in Cairo. The investigating commission had been tasked with looking into the clashes which occurred between the protestors and the police during this uprising. It was found that the majority of the fatalities suffered by the protesters were the results of the deliberate use of lethal force by the security services. The death toll was 365 people. A reconciliation agreement was signed in May and the former president Hosni Mubarak along with his sons were set to stand trial for charges of corruption, abuse of power, and authorizing the security forces to use lethal force in killing the protesters. Some police officers who were charged with killing protesters were released from prison on bail but still face charges in state courts. Protests continued in the face of certain government ministers being acquitted of their corruption charges. 700 senior police officers were fired due to the killing of protesters that took place in January. 1 week after this announcement the new cabinet was established and the interim government announced that elections will be held on November 28th of the same year and in that period more protesters gathered, were faced with repressive tactics, and killed by police forces. The government issued apologies for the continued deaths of protesters. The United States publicly criticized the violence against protesters and protesters. The first round of parliamentary elections did go forward in November as scheduled in spite of the unrest. It noted was that the Muslim Brotherhood had some of the highest totals. One year after the start of the protests the Muslim Brotherhood was elected as the new leading party for the country and the new president was elected. These should prove valuable for your planned paper. You may also check our 20 topics and 1 sample essay on Egyptian Revolution of 2011 with additional tips for history essay writing. Abdelmottlep, Mamdooh A. “The Egyptian Revolution: An Analysis of the Egyptian Police Response, The Way to the Egyptian Police Reform (Subjective Projection)”. FRCIJ 1.5 (2015): n. pag. Web. Alexander, Anne, and Mostafa Bassiouny. Bread, Freedom, Social Justice. Print. Amin, Galal A, and Wright, Jonathan. Whatever Happened to the Egyptian Revolution?. Print. Baker, Mona. Translating Dissent. Print. El-Bendary, Mohamed. The Egyptian Revolution and Its Aftermath. New York: Algora Pub., 2013. Print. El-Nawawy, Mohammed, and Sahar Khamis. Egyptian Revolution 2.0. New York, NY: Palgrave Macmillan, 2013. Print. Gunning, Jeroen, and Ilan Zvi Baron. Why Occupy a Square?. Print.